On 7 November 1938, Herschel Grynszpan, a young Polish Jewish refugee, seventeen years old, living underground in France, went to the German Embassy in Paris. He was received by Ernst vom Rath, who was attached to the embassy and shot him with a gun. He later explained that the police had actually committed the attack in order to avenge the Jewish victims of Nazi persecution. Two days later, the diplomat died of his injuries. Hitler seized on this matter and denounced the Jewish conspiracy. On the night of 9-10 November, synagogues were burned and Jewish shops were looted throughout Germany. This event, known as "Kristallnacht", was one of the first major anti-Jewish operations orchestrated by the Nazis. 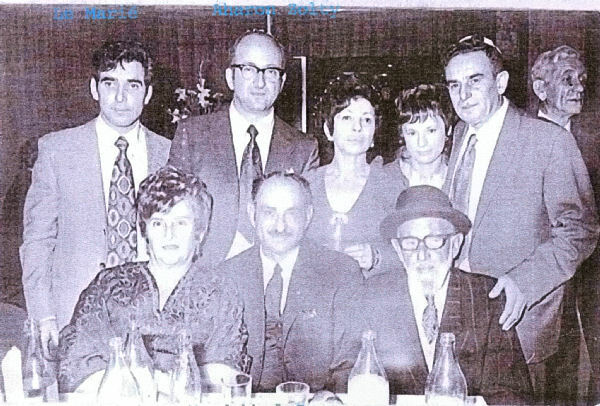 Back row, far left: The Mayor; Aharon Zolty; last four unknown.